Just weeks after releasing a bombshell report accusing senior legislature staff of gross misspending, B.C. 's Speaker has come out with yet another explosive allegation, saying he believes elected officials broke the law. "How could all of this go on without elected officials knowing? That's just not possible," Darryl Plecas told CTV News in an exclusive sit-down interview. "Elected officials absolutely had to know what was going and they did nothing about it." For the first time since his eyebrow-raising allegations against suspended Legislature Clerk Craig James and Sergeant-at-Arms Gary Lenz became public late last month, Plecas made clear he believes MLAs not only contravened spending rules, but also the law. He and his chief of staff, Alan Mullen, were adamant that additional allegations coming in the months ahead go far beyond the allegedly inappropriate work and travel expenses outlined in the initial Jan. 21 report. "Given what I've seen over the past over a year, yeah, there's people going to jail," Mullen told CTV. "The RCMP are spending a lot of resources and they're working around the clock," he added. "They're not looking about who expensed a glass of orange juice or a breakfast when they shouldn't. They're looking at some serious criminal matters." Neither Plecas nor Mullen would go as far divulging whether that investigation includes sitting politicians. They also refused to detail exactly what the allegations might be or who they're against, citing the possibility that their answer could affect the RCMP investigation currently underway at the legislature. There were two high-profile MLAs named in the initial report - former Speakers Linda Reid and Bill Barisoff - but it's unclear if either of them are part of the probe. The RCMP itself was tight-lipped on the details this week, saying "we are not in a position to confirm any specific details with respect to the ongoing and active investigation at the B.C. legislature." The Speaker's scathing 76-page report accuses James and Lenz - who have strongly denied any wrongdoing – of "flagrant overspending" of public money on things such as travel, souvenirs, luggage, clothing and even a wood splitter worth thousands. In the report, Plecas also raises questions about more than $257,000 he alleges James may have received in 2012 as part of a retirement allowance program "that had in fact ended in 1987." In the immediate aftermath of the report, Plecas and Mullen suggested the allegations against the suspended officials were just the tip of the iceberg, but both stopped short of saying whether any of the allegations might be criminal in nature. "I think what will happen down the road in the coming weeks and months - people will be very disturbed by what else is yet to come," the Speaker said. According to the BC Prosecution Service, two special prosecutors were appointed to the case following a request from the RCMP on Sept. 28. Days later, David Butcher and Brock Martland were appointed to provide police with legal advice during the investigation. Mullen told CTV whistleblowers have been contacting them daily since the report's release. "I'd say I'm speaking to a couple of new people every day," he said, adding that the number of people who have come forward with information is now in the dozens and isn't limited to just those who have worked at the legislature. "I'm seeing people from private sector, from Crown Corporations as well as the legislature coming saying, 'Boy, have I got something to say about wrongdoing in this province,'" Mullen said. None of the allegations against anyone who might be involved in the investigation have been proven in court. In addition to voting to make Plecas's report public last month, the Legislative Assembly Management Committee voted to launch a workplace review that will be submitted to an auditor outside the province as well as conduct an audit of the legislature's financial issues. "We have this long history of issues being called to the attention of the Speaker, elected officials… and absolutely nothing being done about it," Plecas said. "The legislature is the only place that operates like an island. It's like the Vatican. Nobody has jurisdiction. The police can want to come on the property to investigate something and the way it's been in the past, they just tell police to take a hike." Just days after the report was released, B.C. Auditor General Carol Bellringer announced she had started a deep audit into the allegations, expressing concern about why the existing system had not picked up on alleged irregularities outlined in the report by the Speaker. The report also triggered calls for more transparency at the legislature by groups including the B.C. Freedom of Information and Privacy Association. The activities and expenses of staff - including James and Lenz - are currently not subject to the Freedom of Information rules—which means they're not directly accountable to the public when it comes to how they're spending taxpayer dollars. Mullen and Plecas continue to defend the motivation behind their probe into spending at the legislature as non-partisan, despite critics suggesting the Speaker had an axe to grind with the BC Liberals after leaving the party to become an independent and take the role of Speaker. In the weeks between James and Lenz's suspension and the release of the report, Plecas came under fire from all sides, with Liberal Leader Andrew Wilkinson going so far as to suggest the Speaker was "building his own little empire, staffed with expensive lawyers, with investigators with no credentials." Following the release of the document, however, some said Plecas had been vindicated, while the Liberals - under whom most of the alleged misspending outlined in the report would have taken place - tried to shift the narrative from placing blame to inter-party co-operation. Plecas said the reaction since the report was made public has been "comforting given what happened in the two months prior to that." "At least what I'm hearing is that the general public is very happy that something is being done to call attention to inappropriate spending of taxpayer dollars," he said. But Mullen said "that quickly turns to sadness and shock and outrage at times. British Columbians want answers and they want more answers." The Speaker has also been lambasted for at one point suggesting Mullen himself could serve as interim Sergeant-at-Arms. "My rationale for doing that will become blatantly obvious in the weeks or at least months ahead," Plecas told CTV. That too, the Speaker said, is a matter of police investigation, which means taxpayers could be waiting months for the next chapter in a scandal that has already rocked B.C. politics to its core. Plecas's full report follows. Viewing this on our beta mobile site? Tap here to see a compatible version. B.C. 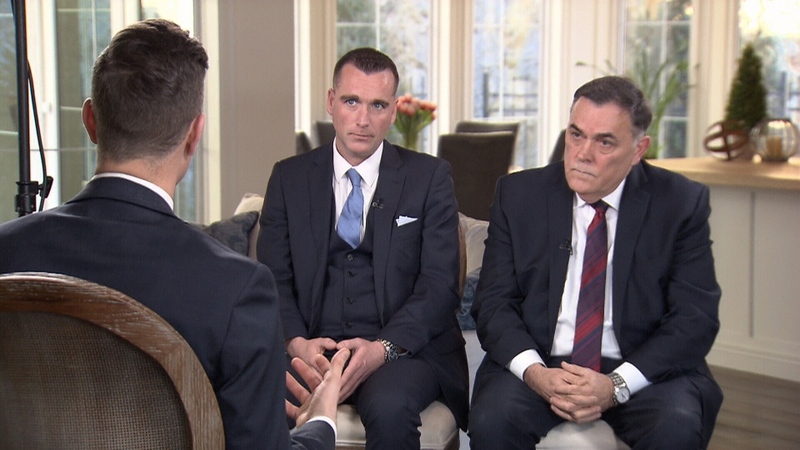 Speaker Darryl Plecas (right) and chief of staff Alan Mullen sit down with CTV Vancouver's Scott Roberts.